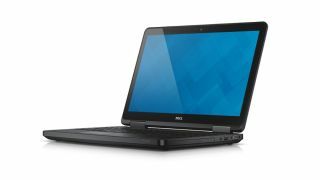 Dell has souped up its Latitude 3000, 5000 and 7000 corporate Ultrabook and laptop ranges to include Intel's fourth-generation Haswell CPU and optional touchscreens. Its new flagship 7000 Series models flaunt Ultrabook stylings, available in a 12- and 14-inch model. The 12-inch edition measures 20mm thick and weighs 1.3kg, coming in at just a smidgeon plumper than Apple's 13-inch MacBook Air (17mm thick) and weighing the same. But that beauty isn't skin deep as the Ultrabooks feature Dell's Intel vPro capabilities for remote BIOS management, are backwards compatible with previous E-Series Latitude docks and are configured with government-grade system disk encryption. Dell claims that the high-end models are a solid option for business and home users alike. The laptops run on Intel ultra-low voltage processors in i5 or i7 variations, are housed in brushed aluminium cases reinforced with magnesium alloy and can be quipped with a full-HD display. If you're not that enamoured with a touchscreeen, you can pick one up now from £789. Touch screen versions are due to see the light of day on September 12. They are joined by new 5000 Series laptops available in 14.1-inch or 15.6-inch sizes. As with the 7000 series models, they are protected by Corning's Gorilla Glass NBT, which the company claims is 10 times stronger than the soda lime glass that's standard on today's industry models. The laptops come in optional SSD or hybrid SSD configurations and feature mobile broadband, Bluetooth and Wireless LAN connectivity. They are also compatible with Dell's existing Latitude E-family docking stations. At the budget end are Dell's new 3000 Series models, which feature a more traditional laptop design but can be upgraded with discrete graphics packing up to 2GB RAM. Available at a starting price of £429, you will also be able to pick both the 3000 Series and 5000 Series models from September 12. We ask: what's best for a business user - a laptop or a tablet?